This is kind of a big one…Lots of information…I hope you can wade your way through it…I think it will be worth it. 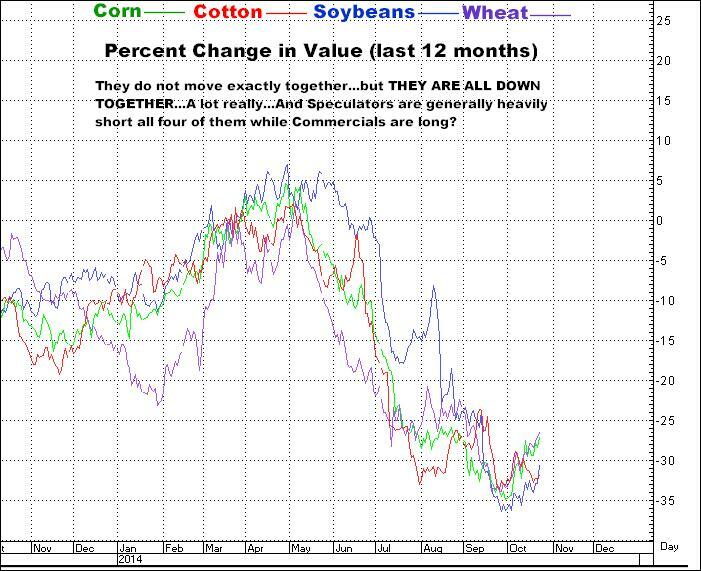 I DON’T THINK I HAVE EVER SEEN THE TRADING COMMUNITY AS UNIVERSALLY BEARISH ROW CROPS (CORN, COTTON, SOYBEANS & WHEAT) AS THEY ARE NOW. Specifically, I recommend buying them in units composed of 1 call in each of these 4 markets, using the March or May 2015 contracts. Basic Rule – Whether it’s Stocks, Bonds or Commodities—Buy it when everybody hates it. While there is nothing that works all of the time, one thing I have repeatedly seen, really, too many times to count, are situations where ALL the supposed “logic” argued TOTALLY for one side of the market…and prices went sharply in the opposite direction. Overwhelmingly one sided sentiment DOES change the supply and demand dynamics of any market…Prices are determined by producers, users and speculators getting in…and out…of markets, being buyers or sellers…And when, for example, 125% of the analysis out there is screaming, “Going lower!”, it does affect what comes next. You do reach a point where every potential seller DOES sell, thinking, “My crop is just going to be worth less if I wait”, and every potential buyer thinks, “No need to get any of my future needs bought. There’s plenty of it everywhere”, meaning that users, who WILL need the commodity, sit there with nothing bought…Simply stated, you reach the point in time where virtually ALL the sellers have sold and NONE of the buyers have bought. When you then throw the presence of speculators into the equation (not just producers and users), at market bottoms you usually have herds of sheep-like sellers, who, with all the endless, so logical, totally bearish rhetoric EVERYWHERE, think there is “easy” money on the downside, and are short, in big numbers…And to exit those positions, they have to become buyers as the market begins to go the wrong way. 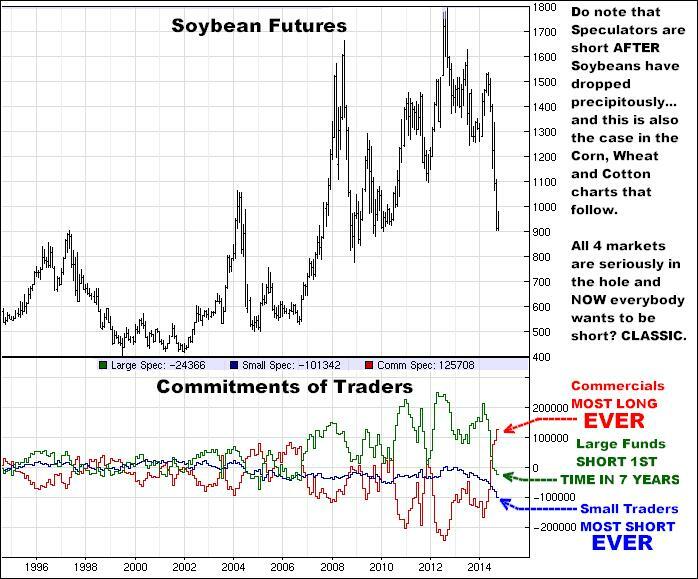 This buying (“short covering”) can often produce big, fast straight up sort of rallies when a market is so overloaded with those shorts…which is exactly what I think is beginning to happen in Corn, Cotton, Soybeans and Wheat. To give you an idea of what I mean, here are some longer term charts that trace exactly which traders are long and which are short…and in what relative numbers they are doing so. To be clear, that Record Long Position held by the Commercials is representative of how much business (a LOT) they have on their books…When, for example, Japan calls a grain dealer here in the USA and orders, at today’s prices, a million bushels of Soybeans for delivery in every month for the next 6 months, this commercial dealer immediately hedges that purchase by buying Soybean futures in each of those 6 contracted months to protect themselves against price increases that may have taken place in the cash market when it is time for them to actually purchase and then deliver those soybeans to the Japanese buyer…Therefore, the chart above suggests there IS a ton of business on the books, and furthermore, there IS equally massive WORLDWIDE demand to more than counter all this “greatest crops ever” talk that is apparently the ONLY thing 99% of analysts and traders seem to be focusing on…and to me, this set up argues for one thing: SHARPLY HIGHER PRICES, NOT ONLY IN SOYBEANS BUT IN CORN, WHEAT AND COTTON AS WELL. 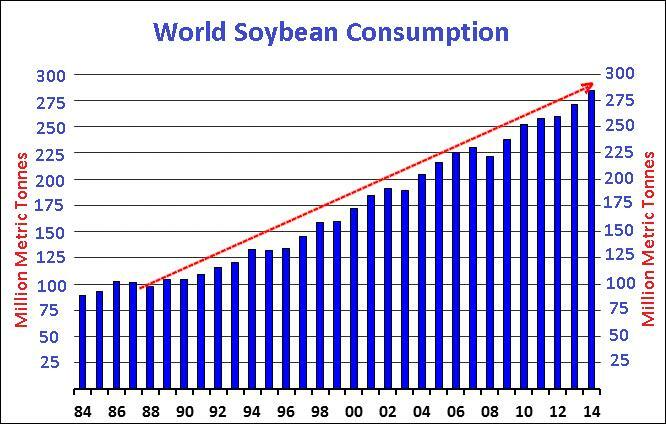 And it is important to remember, when it does become time to make those deliveries, it often becomes necessary for the commercials to offer farmers higher, and then higher, and then higher prices to get those Beans (or Corn, Wheat & Cotton) out of the farmer’s hands and into the pipeline. 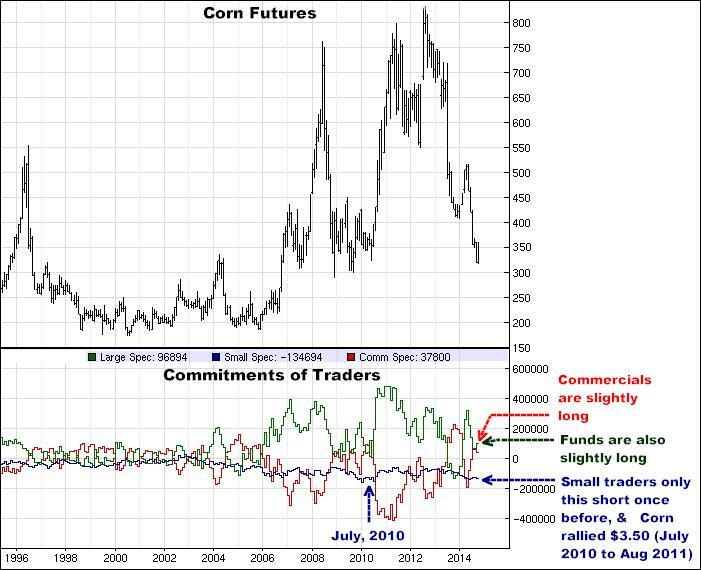 And here’s Corn…where the picture is more mixed…but notably, the Funds and Commercials are slightly long, while small traders (typically the most uninformed and biggest losers in the markets) have a near record short for them as a group…As I always have to point out, NOTHING is absolute in this business but I just don’t see how this could be anything but bullish for Corn…I mean, all the little guys on the opposite side of the fence from the big boys? How many times do you have to see it…where all the analysts, talking heads and traders are ALL on one side of the market? For the 1000th time, this whole trading thing, whether it’s stocks or commodities, is a giant GAME…and as in all games, there are winners and losers…and do you really think the “prize” is going to go to all those speculators who are pretty much UNANIMOUSLY short? 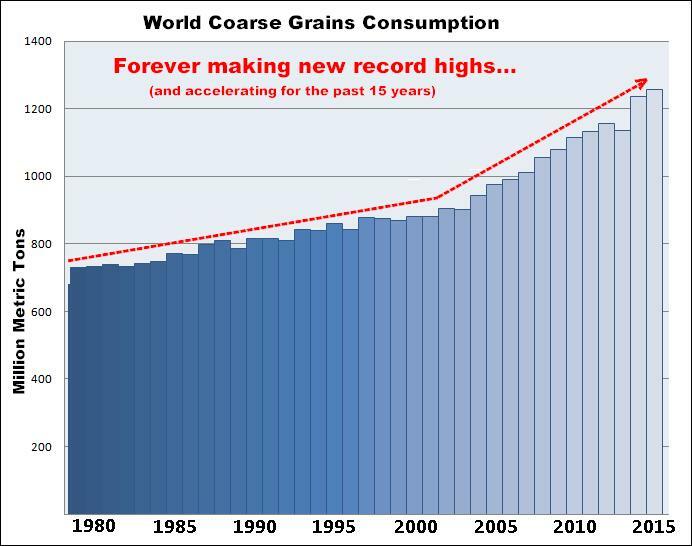 Coarse Grains are cereal grains other than Wheat and Rice, primarily used for feeding livestock. 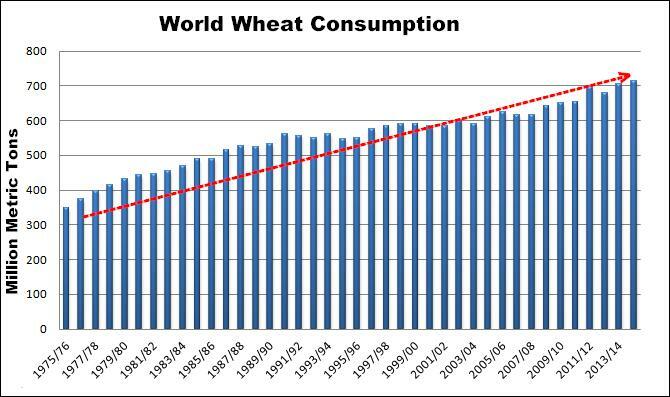 Again, the point is, yes, we do have big crops out there…but we also have record world demand…and I am more than willing to bet that all those guys who are so LOADED on the short side are going to end up losing money. Although none of this means these markets HAVE to go up, with all four of them deeply in the hole, and everybody SO bearish (just as they were wildly bullish 2 years ago when the grains were MANY dollars higher), I think it makes sense to have your money spread across the board, with call options, in all of them. This ain’t complicated. My opinion is you might just be sitting here 3-4-5 months from now with all four of them having made a decent to serious hit, or you might have profits in two out of four, or even just one…which, as a function of leverage, I think would mean you could come out ahead in all of those cases…again, maybe a little but maybe a LOT…Obviously, if we stay down, or go lower, in all of them, you could stand to lose everything you have on the table. That being said, I can pretty much promise you, if all of these markets ARE still sitting here 4 or 5 months from now, or are lower, I WILL be telling you to buy them again…I mean, give all of these markets a good look on the long term charts…Those ever growing world demand numbers are for real…And all of these markets are constantly go Down AND UP…and I absolutely believe the next bet in on the UP side. Here are options I like in each of these markets at current levels…As always, I think the best advice I can give you is: Write the check. Buy the options. Forget you have the position for 2 or 3 months. REALLY. 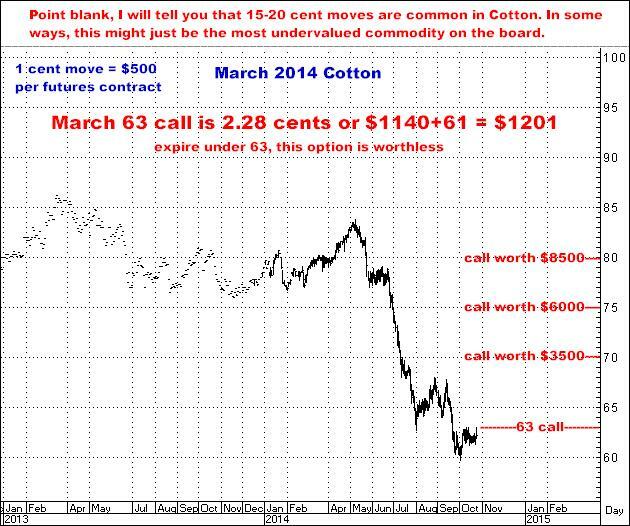 ALL OPTION PRICES SHOWN IN THIS NEWSLETTER INCLUDE ALL FEES AND COMMISSIONS. If I am right about the grains, one consequence of a bull market in feed costs will be, to put it mildly, a severely diminished interest in anyone wanting to pay $2.40 cents a pound to put steers in a feedlot and spend 5 or 6 months feeding them ever more expensive feed to fatten them up for sale as beef cows…In other words, a bullish move in Corn would probably help crash the Feeder Cattle market…Just as fuel costs are the primary factor as to profitability for airlines, such is the case with Corn and Feeder Cattle. In fact, it should not be too difficult to see the fairly direct relationship between the two on the chart following. 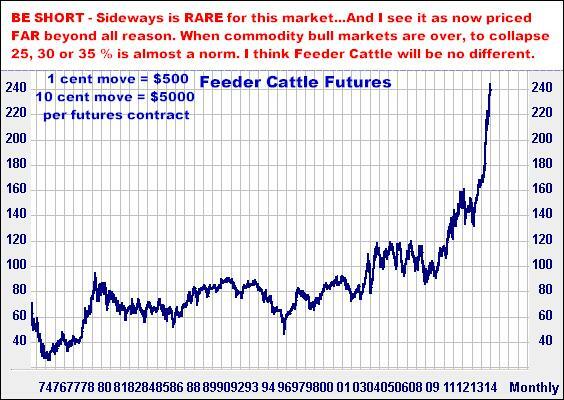 As Corn went down, Feeder Cattle went up…If Corn IS turning up, it absolutely should NOT be good for Feeder Cattle prices. 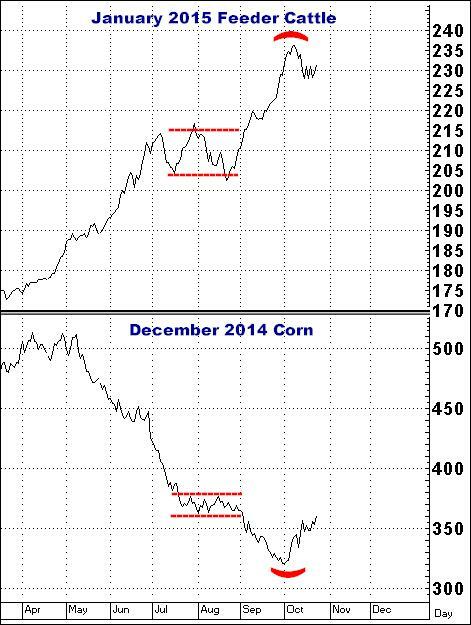 Corn has already rallied about 40 cents, which appears to have potentially ended the bull move in Feeders…And believe me, this Corn rally was NOT expected by cattle feeders...and the LAST thing they expect to see is even higher Corn prices. I still think the Cattle Complex is a disaster waiting to happen. I have heard it from so many sources: “There ain’t no cattle. 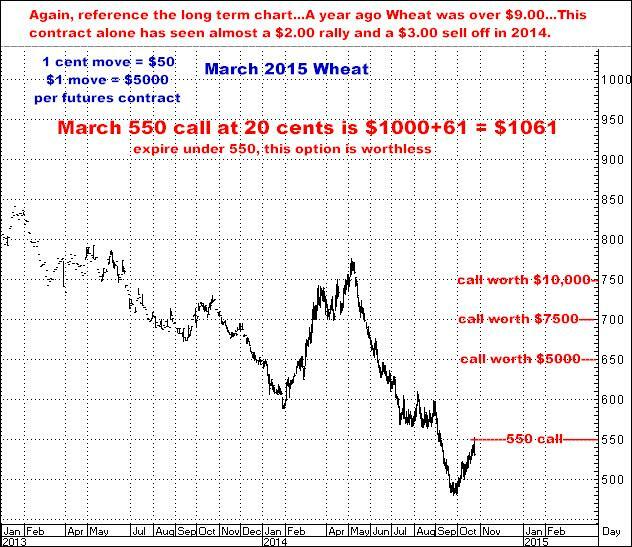 And with grain prices gonna stay low for a long time, Cattle are gonna be good for at least the next few years”. 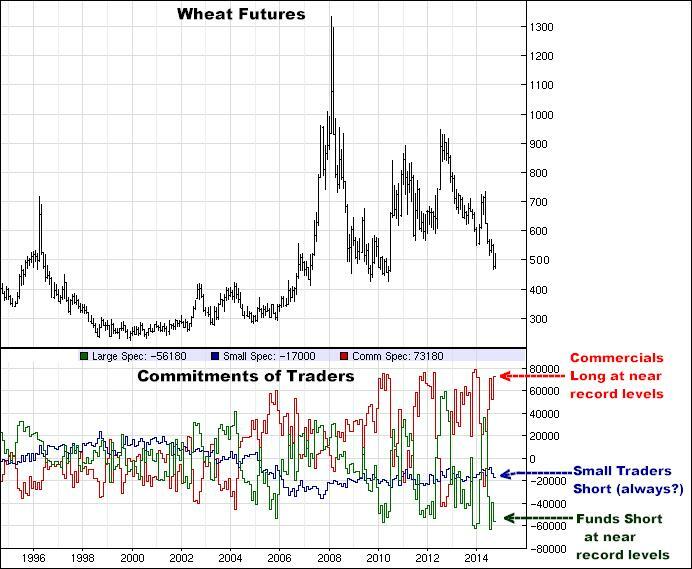 Again, I HAVE HEARD THAT MANTRA EVERYWHERE…and I think it is totally in error…I absolutely believe Cattle will follow the route that grains have taken the past few years…MEANING, THEY WILL TRADE SERIOUSLY LOWER…IN BIG, BIG PERCENTAGES. 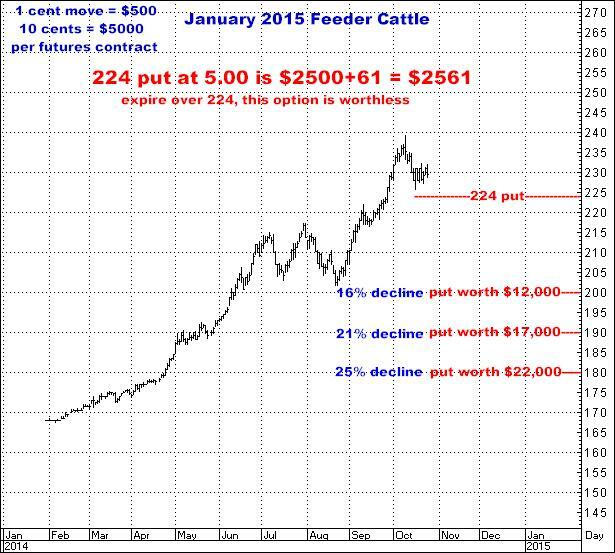 I CONTINUE TO RECOMMEND BUYING PUTS IN FEEDER CATTLE. 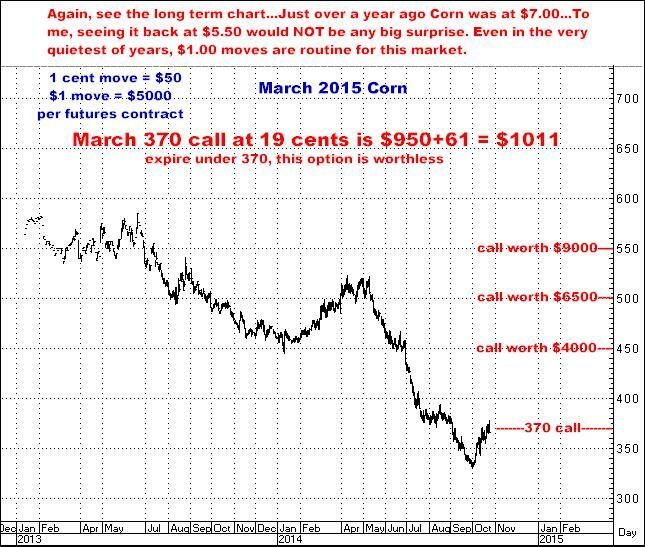 I THINK THEY WILL HAVE FALLEN 25%-30% (60-75 cents, or $30,000-$37,500 per futures contract) before we get to next spring. Do the math. I think every one of these positions is well thought out and has great odds of connecting. While it is certainly possible I am dead wrong on all five markets, which would mean losing 100% of what you have invested, it is also certainly possible that being right on just one of them could put you ahead of the game. I know, when seemingly every advisor in the world is Oh-My-God-Bearish (Where will we put it all? 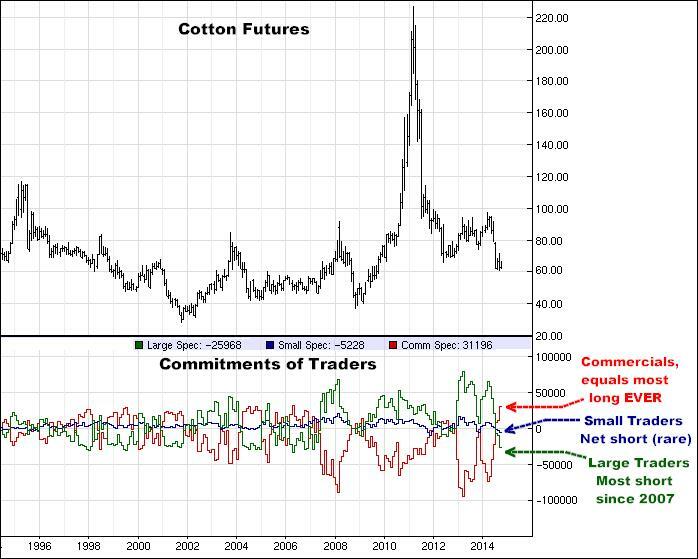 ), it’s difficult to envision these markets being 20 or 30 percent higher but that is the way this stuff works…and those are “normal” sized moves for these commodities. 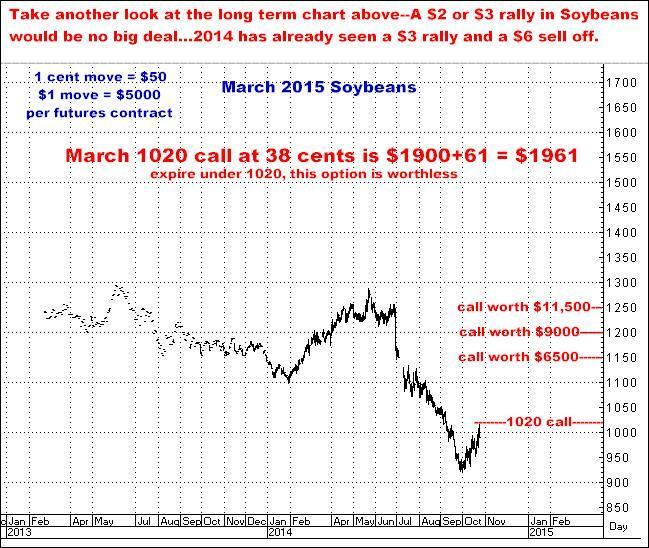 Yes, I am biased but I LOVE THIS IDEA…I LOVE THE NUMBERS…Buy all 4 row crop calls and buy the 1 Feeder Cattle put…and spend about $7800…then leave it alone…This ain’t wishful thinking. I think all of the above, to some significant degree, is going to happen…and I think it COULD happen big. Don’t know for sure, and one more time, I’m obligated to tell you that if I’m wrong you could lose 100% of what you have on the table…But I just don’t think that is at all the way this is going to play out. Just do it. Call me if you want to…You know I enjoy talking to all of you, whether you want to act or anything here or not.